Are You Regularly Throwing Money Into The Dustbin? Do you regularly throw food, and therefore money, into the dustbin? Do you know how much food waste your restaurant generates each week? If you don’t know how much food you waste every week, here is a little experiment that you can begin today. Over the next week, split your food waste into three separate, preferable transparent, bags. You will need one bag for peelings and other unavoidable waste, one bag for food that is out-of-date or otherwise unusable and one bag for the food that has been served to customers but returned to the kitchen uneaten. Before you discard each bag of food each day, weigh it and keep a record. At the end of the week, calculate how much waste was generated by undisciplined buying of ingredients and inefficient portion sizing by adding up the weight of bag number 2 and bag number 3. Now calculate how much this avoidable waste has cost your business. The Sustainable Restaurant Association recently analysed how much unused food is regularly discarded at 92 restaurants nationwide as part of their Foodsave programme. 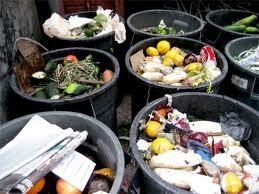 They calculated that at least 600,000 tons of food is wasted by restaurants in the UK every year. That is approximately 7 tons per eatery meaning that the average restaurant is literally throwing at least £20,000 per year into the dustbin! They found that 5% of the food was discarded because it was out-of-date or unusable. The SRA concluded that food waste caused by the disposal of out-of-date and otherwise unusable food can be greatly reduced just by having an efficient ordering system in place. MenuAnalyser will generate accurate Supplier Order Lists for you at recipe or menu level. 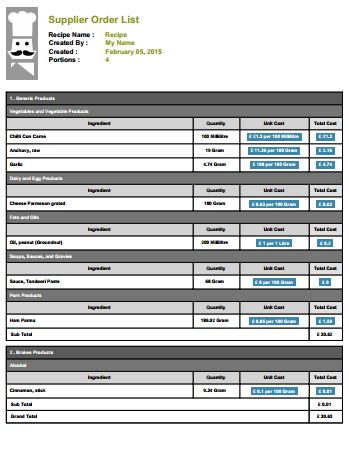 Your Supplier Order List but with additional pricing information. As above but at the Menu level.